Before we can replicate any circumstances of an issue, and assuming we have access to any production logs, we first need to establish some testing guidelines. This involves doing things like mimicking the production database, the user accounts involved, and even the operating system. Everything is fair game here. Once you've established the circumstances that you think might throw the exception or error you are hunting down, it's time to test them. Never test exceptions in production. Development and staging environments are designed to be breakable without any impact on the end users, so always always always try to break your code in a safe environment. If you were unable to replicate the problem in Step 2, then it's back to the drawing board. Not every error is easy to reproduce, and may have time-based constraints or something else making it difficult to replicate in a non-production environment. Jump back to Step 1, adjust your test parameters, and try it all over again. With source maps enabled, the breakpoint in the compiled script can be mapped directly to the original source file in CoffeeScript. This makes it possible to debug issues in the context of the source files, rather than the compiled and sanitized files that make it into the production environment. Whenever exceptions are thrown, a stack trace is usually included. But, what is a stack trace? In essence, it is a rundown of every file and function that is called leading up to the error. To be clear, a stack trace doesn't include the files and functions that are touched before the error occurred, only the chain of methods that are called as the error happened. This allows you to "trace" the "stack" of operations that are performed when an error happened in order to identify exactly what went wrong, and where. As you can see, rather than simply returning the exception message, reading the stack trace in reverse order shows that the exception was thrown on line 1 at column 7, but was triggered by a call to dothething() on line 2 at column 9. For more complicated stack traces, this can be invaluable as it gives us a lot of post-mortem information. While diagnosing bugs via log files works in some cases, sometimes a little more power is required. Thankfully, in most browsers it is possible to pause running scripts and step through them in order to identify issues as they happen. While doing this, it is possible to view and edit variables and properties, which gives you total control over the state of any running script in order to identify what is happening, where, and why. The browser-based debugger is an incredibly powerful tool, but the basic idea behind its use is that you add breakpoints at points in your codebase where you want to look deeper at the stack and scope of the script. When the debugger encounters these breakpoints, all execution is paused, and you are provided with the opportunity to review the values of any variables, and even modify them to better test assumptions and fix any issues you may be encountering. The challenge when debugging production errors is that you do not have access to the user’s developer console. In order to gather enough context to identify the problem, you need to track information in a central location where your developers can access it. Traditionally, this is done using logs but there is a better way. Rollbar empowers you to not only identify what is happening, but when, where, to whom, and how often. Rather than having to sort through pages of raw text logs, Rollbar aggregates data from individual exceptions and errors and creates a dashboard with as much information as possible for analyzing these issues. Whenever an exception is thrown during the course of an HTTP request, the request details are tracked alongside any additional information—such as the browser and operating system. This gives you the ability to identify any potential issues that could be related to specific systems, or even track down offending request parameters. 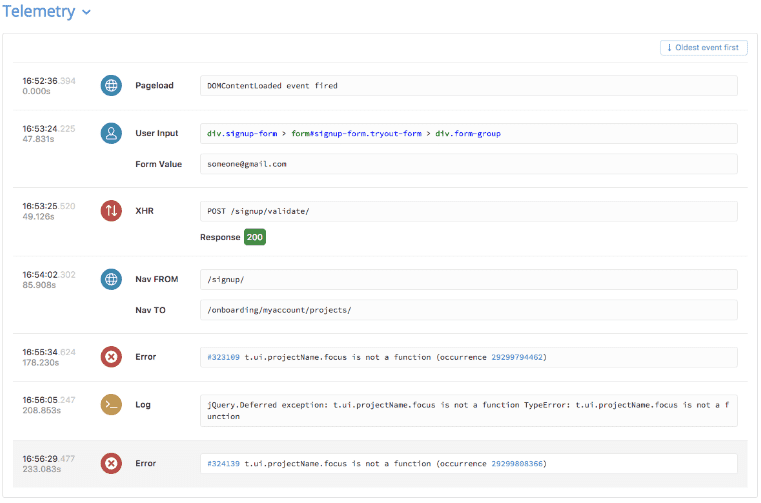 If you are tracking deployments within Rollbar, then identifying which deployment might have been responsible for a new error or exception is as straightforward as possible. So straightforward, in fact, that Rollbar does the work for you. 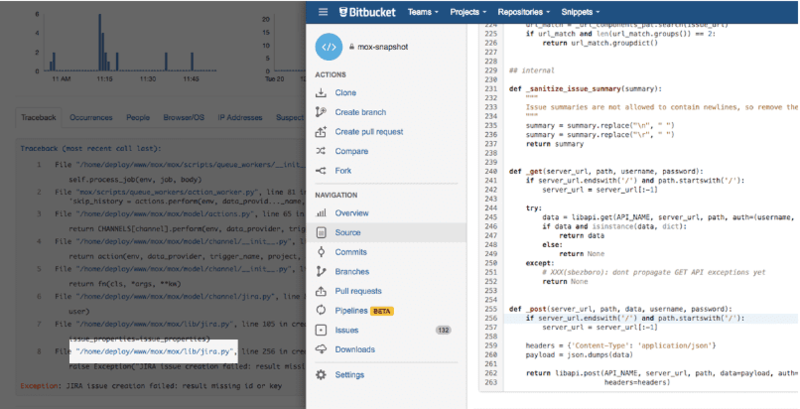 When a Rollbar project is linked to a repository in GitHub, Bitbucket, or GitLab, any file references in a stack trace are automatically linked directly out to the offending file in the linked repository.